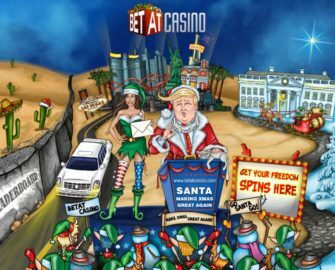 Awesome times for Christmas with Betat Casino! Joyful celebrations for the whole month! Christmas time is upon us and Betat had none other than Santa himself promising to bring back that sweet Xmas charm to all his fans! That’s right, they’ve just embarked on the beginning of four amazing weeks of enticing offers as Santa campaigns to make Xmas great again. Its opening week at the moment and the first of Santa’s policies have been released. Meet Mrs. Claus, who is holding onto your very own 100% deposit bonus. Always one to please, she will hold onto it all month long for you so you can use it whenever you are ready. Any other deposits can also be accompanied with a batch of Freedom Spins on Robin Hood: Shifting Riches or Theme Park: Tickets of Fortune by approaching Santa himself. These will be some great festive weeks at Betat. Freedom Spins – Free Spins on some stimulating titles! Get 1 point for every winning multiplier over x50 for bets that are between €0.30 and €0.99.